Vivian’s passion for the arts is evident in her over 30-year involvement with and contribution to arts and education communities in Toronto. She has been as a trusted leader in the visual art department of the Toronto District School Board and served on committees at OISE/UT, the Ontario Society for Education through Art, and the Ontario Ministry of Education. Vivian has consistently been looked to as a source of knowledge and inspiration for art educators in our city. Freehand School of Art allows Vivian to continue to bring her wealth of expertise and passion for arts education to the community. Vivian holds Honors Specialist Qualification in Visual Arts. 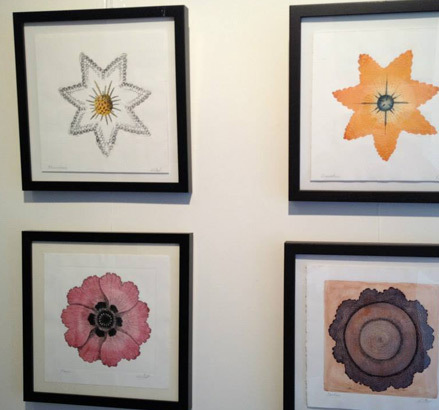 Her artistic training is in drawing, design, printmaking and photography. Julia brings current perspectives on the arts to the school. She is a graduate of the Primary-Junior program at the University of Western Ontario with Visual Arts qualification. Her visual art foundation began at Wexford School for the Arts and continued with art history courses at York University. Julia has more than 10 years of experience in teaching art to early years, primary and junior aged children in schools in Toronto, London, UK and London, Ontario. She has organized and lead community programs for at-risk youth in Toronto and has delivered numerous in-school visual art workshops with the Toronto District School Board. Julia is a working artist with a focus on acrylic and oil painting. Ontario Society for Education through Art. Natasha has been at Freehand since 2011 as the Office Manager. After earning her BScH in Biology and her MSc in Forestry, Natasha lived in London, UK, for four years where she worked in business. When Natasha returned to Canada, she continued her career working for TD Bank and joined the Freehand team when her daughter began attending classes at the school. Natasha is a skilled crafter: she enjoys sewing, cross-stitching, and has taken many classes at Freehand including painting, sculpting, and stained glass. Brad is a Toronto-based artist who works primarily with ceramics. Since he began teaching at Freehand in 2011, Brad has developed passion for helping students uncover their unique artistic interests and develop a love for the arts. Brad’s art education began at Northern Secondary and Central Technical School in Toronto. He went on to study drawing and ceramics at the Nova Scotia College of Art and Design. Brad is currently developing a new body of work in his studio that is comprised of drawings, sculptures and mixed media works inspired by the human form. Francis has over twenty years’ experience as a professional artist and art instructor. After graduating from the University of Toronto with a B.A. in philosophy, Francis studied painting in the atelier of Michael John Angel in Florence. Since 1999, he has been the resident art restorer for Old Master Gallery in Toronto, and he has worked as an illustrator for Integrate New Ideas Co. Francis is renowned for his portraits, murals and stained glass windows that decorate the city of Toronto. He is currently working on a series of plein air landscape and figurative paintings inspired by the Canadian shield. Francis is also a teacher with the Toronto District School Board. Erin is a Toronto-based artist and illustrator and has been teaching at Freehand since 2013. Erin holds a degree in New Media from the University of Lethbridge as well as a post-graduate certificate in Interactive Multimedia from Sheridan College. With specializations in computer-based vector illustration, watercolours and linoleum prints, Erin offers a wide range of expertise to her students. To see more of Erin’s work, visit her Instagram page. Madison is a Toronto-based artist and student at the Ontario College of Art and Design. Madison began at Freehand as a student with a passion for the arts. As her artistic skill and interest in teaching grew, Madison began working as a volunteer and, soon after, an instructor. Madison is particularly interested in teaching at the primary level, where she works to instill confidence, basic artistic skills, and a love for art. 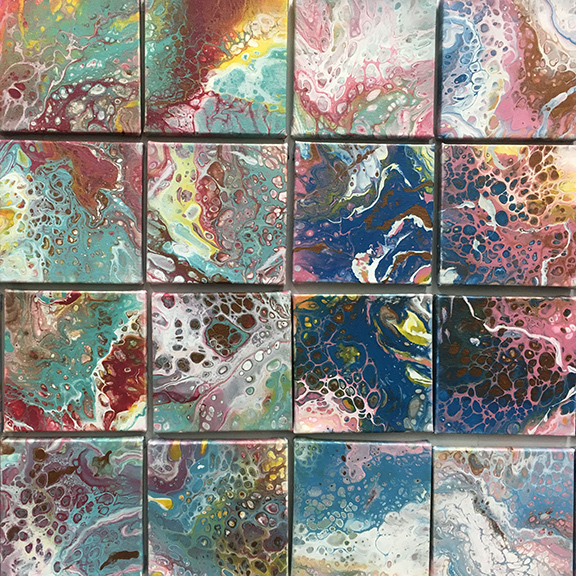 Madison is currently developing a series of poured paintings using conditioned acrylic paints. Catherine began her visual arts study at Ridley College, and graduated with a Bachelor of Arts from the University of Toronto. 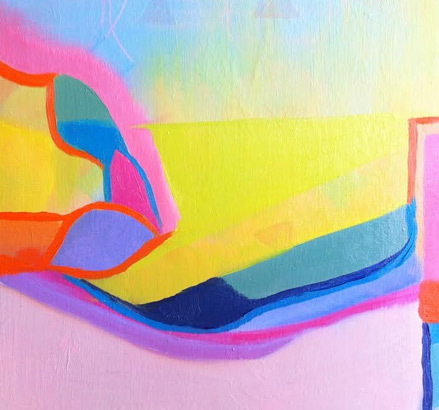 Catherine is known for her interest in abstraction and colour theory, which she explores in both her classes and her own art practice. Cultivating a creative and therapeutic approach, Catherine integrates her experience as a professional artist with her studies in health and wellness. Catherine aims to guide students through an intuitive process to discover new methods of visual expression and communication through the visual arts medium. Mona is a Toronto based artist who has a great passion for art, yoga and kids. After finishing her BA in fine art at Azad University in Iran, she moved to Canada where she had been teaching art and also elementary classes (in a Montessori school) for over 10 years now. Lydia is an educator and self-taught artist. After receiving her B.A. (Hon) from the University of Toronto, Lydia earned her M.Phil from Oxford University, and her PhD from Harvard University. Lydia’s extensive teaching experience includes her work as a Teaching Fellow at Harvard (2009-2011), Sessional Instructor at UofT (2013), and tutor/course instructor for grades K-12 at Inspiration Learning Centre Toronto. Lydia specializes in plasticine illustration and origami, and has thematic interests in natural history. She is currently developing a series of large-scale plasticine illustrations of wetland and watershed habitats based on scientific drawings and engravings. Born into a family of artists, Shayona’s earliest teacher and mentor in art was her mother, a poet and painter who instilled in her a lifelong love of drawing and painting. Shayona went on to gain experience through studio classes in perspective drawing, life drawing, portrait painting and a four year apprenticeship at a Toronto mural painting studio. After studying to become and early childhood educator (ECE), she received certification in children’s mental health through a yearlong York University program, which was developed in collaboration with the Hospital for Sick Children. With her experience as a registered ECE at one of Toronto’s only art-based curriculum, public elementary schools, and in mural and portrait painting, she is excited about being able to use her background in both the arts and education to deliver responsive, creative programming at Freehand School of Art.